Smoking is one of the most detrimental habits associated with a whole bunch of medical conditions. Not only that smoking may cause addiction all people who smoke for a long time must be familiar with negative effects of the cigarette components on their bodies. It is also confirmed that exposure to second hand smoke increases a risk for many illnesses. So apart from hurting themselves, people who smoke also jeopardize health of people from their surrounding. Many people stop smoking once they are diagnosed with certain condition that commonly results from smoking. Unfortunately once the person develops an illness it may be too late and quitting smoking will not help in curing the disease. It is estimated that majority of people who are long-term smokers develop lung cancer, cancer of the oral cavity, larynx, esophagus and bladder more than people who are non-smokers. The risk is increased in heavy smokers and those who smoke for many years. And finally, the number of cigarettes smoked per day also influences the risk for certain types of cancer. People who are smokers are prone to certain respiratory illnesses. This particularly refers to chronic obstructive disease, emphysema and chronic bronchitis. In case a person quits smoking on time the risk for these illnesses reduces. Smoking is also associated with many cardiovascular illnesses. For example, people who are long-term smokers are at higher risk for high blood pressure and heart attack. Furthermore, smoking may lead to peripheral artery disease and is responsible for stroke and brain hemorrhage. 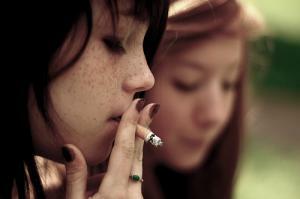 It is estimated that women smokers have lesser chance to conceive. They are suffering from infertility, miscarriages and complicated pregnancies more than women who do not smoke. Smoking is also responsible for early menopause. In pregnant and breastfeeding women smoking may have hazardous effect on the baby. In men smoking is connected with sperm abnormalities and male infertility. Effects of smoking on the osteomuscluar system develop in a form of osteopenia, osteoporosis and increased risk of fractures and tissue injuries. Furthermore, smoking is associated with bad breath, dental cavity, stained teeth, mouth sores and receding gums. The detrimental effects of smoking are more intensive in chain smokers and they typically develop at least one of the previously mentioned illnesses much before people who do not smoke. It is important to mention that even people who do not smoke but are exposed to second hand smoke are also at the risk for the previously mentioned illnesses.